Although John Wesley Powell and party are usually given credit for the first river descent through the Grand Canyon, the ghost of James White has haunted those claims. White was a Colorado prospector, who, almost two years before Powell's journey, washed up on a makeshift raft at Callville, Nevada. 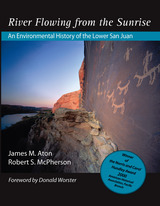 His claim to have entered the Colorado above the San Juan River with another man (soon drowned) as they fled from Indians was widely disseminated and believed for a time, but Powell and his successors on the river publically discounted it. Colorado River runners and historians have since debated whether White's passage through Grand Canyon even could have happened. Hell or High Water is the first full account of White's story and how it became distorted and he disparaged over time. 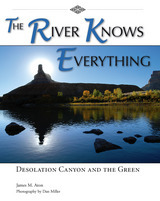 It is also a fascinating detective story, recounting how White's granddaughter, Eilean Adams, over decades and with the assistance of a couple of notable Colorado River historians who believed he could have done what he claimed, gradually uncovered the record of James White's adventure and put together a plausible narrative of how and why he ended up floating helplessly down a turbulent river, entrenched in massive cliffs, with nothing but a driftwood raft to carry him through. One wonders if there is any academic field that doesn’t suffer from the way it is portrayed by the media, by politicians, by pundits and other publics. How well scholars in a discipline articulate their own definition can influence not only issues of image but the very success of the discipline in serving students and its other constituencies. The Activist WPA is an effort to address this range of issues for the field of English composition in the age of the Spellings Commission and the No Child Left Behind Act. Drawing on recent developments in framing theory and the resurgent traditions of progressive organizers, Linda Adler-Kassner calls upon composition teachers and administrators to develop strategic programs of collective action that do justice to composition’s best principles. Adler-Kassner argues that the “story” of college composition can be changed only when writing scholars bring the wonders down, to articulate a theory framework that is pragmatic and intelligible to those outside the field--and then create messages that reference that framework. In The Activist WPA, she makes a case for developing a more integrated vision of outreach, English education, and writing program administration. 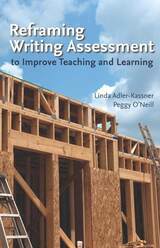 Adler-Kassner and O'Neill show writing faculty and administrators how to frame discussions of writing assessment so that they accurately represent research-based practices, and promote assessments that are valid, reliable, and discipline-appropriate. Public discourse about writing instruction is currently driven by ideas of what instructors and programs “need to do,” “should do,” or “are not doing,” and is based on poorly informed concepts of correctness and unfounded claims about a broad decline in educational quality. This discussion needs to be reframed, say Adler-Kassner and O'Neill, to help policymakers understand that the purpose of writing instruction is to help students develop critical thinking, reading, and writing strategies that will form the foundation for their future educations, professional careers, and civic engagement. Reframing Writing Assessment to Improve Teaching and Learning is grounded in the best of writing assessment research, and focuses on how to communicate it effectively to publics beyond academe. 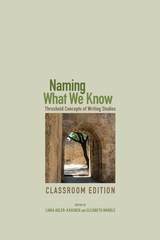 Naming What We Know, Classroom Edition examines the core principles of knowledge in the discipline of writing studies, using the lens of “threshold concepts”—concepts that are critical for epistemological participation in a discipline. This edition focuses on the working definitions of thirty-seven threshold concepts that run throughout the research, teaching, assessment, and public work in writing studies. Developed from the highly regarded original edition in response to grassroots demand from teachers in writing programs around the United States and written by some of the field’s most active researchers and teachers, the classroom edition is clear and accessible for an audience of even first-year writing students. 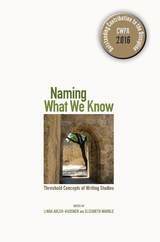 Naming What We Know examines the core principles of knowledge in the discipline of writing studies using the lens of “threshold concepts”—concepts that are critical for epistemological participation in a discipline. The first part of the book defines and describes thirty-seven threshold concepts of the discipline in entries written by some of the field’s most active researchers and teachers, all of whom participated in a collaborative wiki discussion guided by the editors. These entries are clear and accessible, written for an audience of writing scholars, students, and colleagues in other disciplines and policy makers outside the academy. 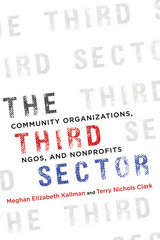 Contributors describe the conceptual background of the field and the principles that run throughout practice, whether in research, teaching, assessment, or public work around writing. Chapters in the second part of the book describe the benefits and challenges of using threshold concepts in specific sites—first-year writing programs, WAC/WID programs, writing centers, writing majors—and for professional development to present this framework in action. Naming What We Know opens a dialogue about the concepts that writing scholars and teachers agree are critical and about why those concepts should and do matter to people outside the field. Despite its centrality to much of contemporary personal and public discourse, sexuality remains infrequently discussed in most composition courses, and in our discipline at large. Moreover, its complicated relationship to discourse, to the very languages we use to describe and define our worlds, is woefully understudied in our discipline. Discourse about sexuality, and the discourse of sexuality, surround us—circulating in the news media, on the Web, in conversations, and in the very languages we use to articulate our interactions with others and our understanding of ourselves. 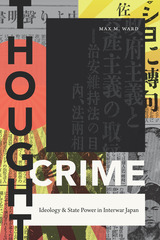 It forms a core set of complex discourses through which we approach, make sense of, and construct a variety of meanings, politics, and identities. 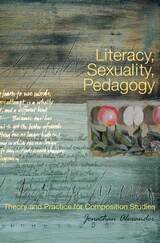 In Literacy, Sexuality, Pedagogy, Jonathan Alexander argues for the development of students' "sexual literacy." Such a literacy is not just concerned with developing fluency with sexuality as a "hot" topic, but with understanding the intimate interconnectedness of sexuality and literacy in Western culture. Using the work of scholars in queer theory, sexuality studies, and the New Literacy Studies, Alexander unpacks what he sees as a crucial--if often overlooked--dimension of literacy: the fundamental ways in which sexuality has become a key component of contemporary literate practice, of the stories we tell about ourselves, our communities, and our political investments. Alexander then demonstrates through a series of composition exercises and writing assignments how we might develop students' understanding of sexual literacy. Examining discourses of gender, heterosexuality, and marriage allows students (and instructors) a critical opportunity to see how the languages we use to describe ourselves and our communities are saturated with ideologies of sexuality. Understanding how sexuality is constructed and deployed as a way to "make meaning" in our culture gives us a critical tool both to understand some of the fundamental ways in which we know ourselves and to challenge some of the norms that govern our lives. In the process, we become more fluent with the stories that we tell about ourselves and discover how normative notions of sexuality enable (and constrain) narrations of identity, culture, and politics. Such develops not only our understanding of sexuality, but of literacy, as we explore how sexuality is a vital, if vexing, part of the story of who we are. On September 11, 1857, a wagon train of emigrants passing through the Utah Territory on their way to California were massacred at Mountain Meadows. Although today’s historians agree that the principal perpetrators were members of the Mormon militia in southern Utah, how much the central Mormon leadership, especially Brigham Young at the top, knew about the massacre, when and how they learned about it, and the extent of a cover up afterward are still matters of controversy and debate. 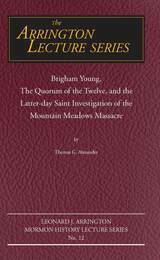 In this 12th volume of the Arrington Lecture Series, Thomas Alexander (Lemuel Redd Professor of Western American History, Emeritus, at Brigham Young University), asserts that Brigham Young and the LDS Church’s governing Quorum of Twelve made timely and diligent efforts to investigate the massacre and encouraged legal proceedings but were hindered by federal territorial officials and lied to by massacre participant John D. Lee, preventing Young from learning the full truth for many years. 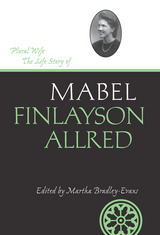 Mabel Finlayson Allred was a wife of Rulon Allred, leader of the Apostolic United Brethren, one of the major groups of fundamentalist Mormons who, since about the 1930s, have practiced plural marriage as separatists from the mainstream Latter-day Saints Church. Mabel’s autobiography maintains a mood of everyday normalcy strikingly in contrast with the stress of the ostracized life she was living. 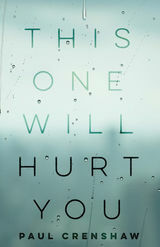 Her cheerful tone, expressive of her wish to live simply and gracefully in this world, is tempered by more somber descriptions of her personal struggle with clinical depression, of Rulon Allred’s inner struggles, of tensions with the law and with Allred’s fundamentalist colleagues, and ultimately by her forthright account of his assassination. 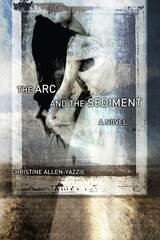 Emerging from this unique narrative is the portrait of a woman buoyed by faith in both her religion and her husband, a window into the interior life of a woman seeking a resilient simplicity in an uncommonly challenging life. Plural Wife, conntextualized by Martha Bradley’s introduction, gives us insight into Mabel’s experience of history during an important period of the 20th century and advances our understanding of life ways of 20th century polygamy and the growth of the fundamentalist movement. LeRoy Anderson in 1981 first published, under the title For Christ Will Come Tomorrow, his definitive study of a charismatic, millenarian prophet and the Church of Jesus Christ of the Most High. 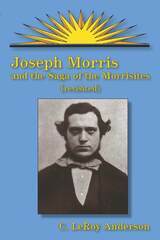 He told there of a Mormon posse’s 1862 attack on the Morrisite compound, killing Joseph Morris, and of the continuing Morrisite movement, which survived into the mid-twentieth century. 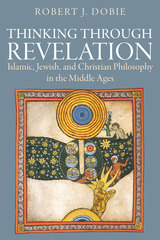 In this newly revised edition, Anderson revisits his subject by referring to more recently discovered documents, considering other scholars’ continuing work on Morris’s sect and related subjects, and examining a 1980s messianic sect that claimed a direct connection to the Morrisites. New documentary sources include a holograph “History of George Morris,” written by Joseph Morris’s brother, which Anderson quotes at length. What was once a little-studied subject has since received attention from a number of scholars. Anderson references such current work on Mormon schismatic movements and broader subjects, much of which drew on his work. Perhaps the book’s most interesting and unintended influence was on that obscure 1980s messianic sect, in Montana, which learned of Morris through Joseph Morris and the Saga of the Morrisites. Volume 12 in the Swenson Poetry Award Series, Mrs. Ramsay's Knee offers fresh and elegant poems by Idris anderson, many of them ekphrastic considerations of visual works of art. Among her subjects are paintings by Rembrandt, Rousseau, Pollock, and Chagall, yet she equally explores a set of news photos from the 2006 war between Israel and Hezbollah. Many recreational hikers have stopped along the trail to admire a wildflower only to wonder what, exactly, they are looking at. 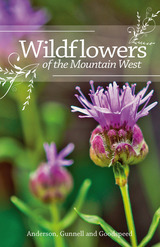 Wildflowers of the Mountain West is a useful field guide that makes flower identification easy for the general outdoor enthusiast. Many available plant guides are too technical or cumbersome for non-specialists to embrace. Covering New Mexico, Colorado, Wyoming, Idaho, Utah, Nevada and Oregon, this book is perfect for the enthusiasts who has little botanical knowledge but would like to know more about the wildflowers they are seeing. Organized by flower color for easy reference, plant records include the common and scientific names, a description of typical characteristics, habitat information and distribution maps, look-alike species, color photographs, and informative commentary. In addition, the book provides a useful introduction to the Mountain West region, along with line drawings to illustrate basic flower parts, shapes, and arrangements; a glossary of common botanical terms; a quick search key; and an index. The book is spiral-bound, making it easy to bring along while hiking, backpacking, or biking, and stunning full color photographs make visual confirmation of flower type simple and straightforward. 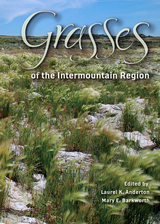 Grasses of the Intermountain Region is a modification of the two grass volumes of the Flora of North America (FNA). It is designed for identifying members of the Poaceae in the region between the Sierra Nevada and Rocky Mountains, and is intended for use by botanists working with the grasses in this intermountain region of North America. The reduction in number of taxa included from FNA has reduced the length of the keys and made it possible to include, in a single volume, descriptions and illustrations for all taxa treated as well as provide distribution maps for species that are established in the area. Another difference from the FNA volumes is that the maps in this volume show only records from IMR and adjacent areas rather than the full North America range of the taxa. “What any body is—and is able to do—cannot be disentangled from the media we use to consume and produce texts.” ---from the Introduction. Kristin Arola and Anne Wysocki argue that composing in new media is composing the body—is embodiment. 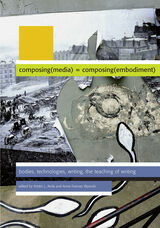 In Composing (Media) = Composing (Embodiment), they havebrought together a powerful set of essays that agree on the need for compositionists—and their students—to engage with a wide range of new media texts. These chapters explore how texts of all varieties mediate and thereby contribute to the human experiences of communication, of self, the body, and composing. Sample assignments and activities exemplify how this exploration might proceed in the writing classroom. The series, established by one of the twentieth-century West's most distinguished historians, Leonard Arrington, has become a leading forum for prominent historians to address topics related to Mormon history. The first lecturer was Arrington himself. 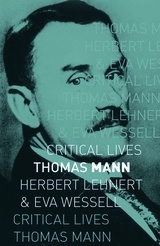 He was followed by Richard Lyman Bushman, Richard E. Bennett, Howard R. Lamar, Claudia L. Bushman, Kenneth W. Godfrey, Jan Shipps, Donald Worster, Laurel Thatcher Ulrich, and F. Ross Peterson. Utah State University hosts the Leonard J. Arrington Mormon History Lecture Series. The University Libraries' Special Collections and Archives houses the Arrington collection. The state's land grant university began collecting records very early, and in the 1960s became a major depository for Utah and Mormon records. Leonard and his wife Grace joined the USU faculty and family in 1946, and the Arringtons and their colleagues worked to collect original diaries, journals, letters, and photographs. Although trained as an economist at the University of North Carolina, Arrington became a Mormon historian of international repute. Working with numerous colleagues, the Twin Falls, Idaho, native produced the classic Great Basin Kingdom: An Economic History of the Latter-day Saints in 1958. 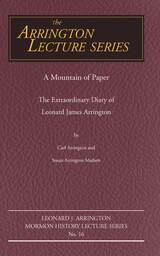 Utilizing available collections at USU, Arrington embarked on a prolific publishing and editing career. He and his close ally, Dr. S. George Ellsworth helped organize the Western History Association, and they created the Western Historical Quarterly as the scholarly voice of the WHA. While serving with Ellsworth as editor of the new journal, Arr ington also helped both the Mormon History Association and the independent journal Dialogue get established. 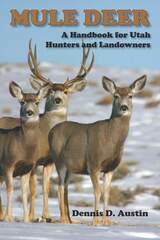 A complete guide to the history, biology, hunting, and management of mule deer in Utah. The author, Dennis D. Austin, is a retired research scientist with more than thirty years of experience working as a wildlife biologist for the Utah Division of Wildlife Resources. 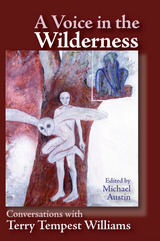 With her distinctive, impassioned voice and familiar felicity of language, Terry Tempest Williams talks about wilderness and wildlife, place and eroticism, art and literature, democracy and politics, family and heritage, Mormonism and religion, writing and creativity, and other subjects that engage her agile mind—in a set of interviews gathered and introduced by Michael Austin to represent the span of her career as a naturalist, author, and activist.